Dear Customers! Spring time has started! What could it bring to your life? New emotions, new feelings, new hopes. Is your heart beating faster? We are here to awake your heart and feelings! Don't lose a chance to send a little part of your heart to your beloved one from TopLop.com! Bouquet of spring flowers (tulips) is waiting for your Sweet Lady! Make her day happier and her sweet kiss will be waiting for you! The language of flowers is fully-variable! Different colors could express your feelings. Red color means love, passion. Yellow color means sunshine, joy. Various colors in one bouquet mean varied feelings! Don't lose a chance to show your real feelings to Your Lady! 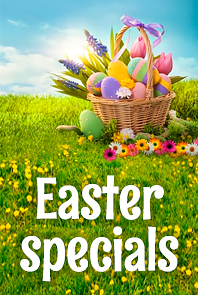 Please pay attention to our limited offer: order a bouquet of tulips and a Teddy Bear from March'1 to March'15 and get 4 Bonus Credits (equals $16)! We wish you our best wishes! Awake your heart with TopLop.com!